Legend has it that "Tall Paul" Volcker rode into town in the summer of 79' on his big blue ox and cut inflation down with a few sharp swipes of his mighty axe. By the time he was through, inflation had fallen from a peak of 13.5% in 1981 to 3.2% by 1983. Although his reign at the Fed was marked by some of "the strongest political attacks and most widespread protests in the history of the Federal Reserve", he is widely recognized today as the greatest Chairman since the Fed was first created in 1913. Nearly nineteen years after Volcker, an amiable and bristled academic from Princeton was chosen to shepherd the Fed in the shadow of one of its largest - and now most controversial personalities. With less than two years into his first term, the US economy had begun a glide-path towards the worst financial crisis since the Great Depression. With interest rates pegged to zero-bound by December of 2008 and inflation stalling out below the Fed's mandate of 2 percent, Bernanke grabbed the QE policy gavel and relentlessly stopped inflation from following rates lower into the back-eddies of deflation. Although we occasionally view participants and pundits perspective of Fed policies with a more cynical tone, the truth is these two legendary Chairmen did preside over the economy and the Fed during the bookend extremes of a truly historic inflation cycle. Forgive our variant point-of-view shown below on rates and inflation. As we typically spend our time looking at asset trends, we've always viewed the inflation narrative bottoms-side-up. The reason being, inflation peaks and troughs quite similar to the cyclical structure of asset prices - you just need to invert the series. Similar to asset price lows, inflation and interest rate highs are typically shorter duration and more violent and volatile events. Inflation and interest rate lows, however, are most often drawn-out processes, such as asset cycle tops. For this reason alone, one could argue that Bernanke had the tougher job of maintaining efficacy and moral through a much longer period - one that started several years before he became Chairman. For all intents and purposes (and there have been many), core PCE - the Fed's preferred measure of inflation, has troughed out over the past 14 years around 1 percent as rates have moved sharply lower. From a comparative perspective, this is similar to the positive structural divergence between interest rates and core PCE following Volcker's "Saturday Night Massacre" in October 1979. The gratification in the data, however, was enjoyed much quicker by participants and pundits of Volcker's Fed. Our experience with asset prices and inverse to the inflation and the interest rate cycle - is it's much easier to spot a low than sell the highs. 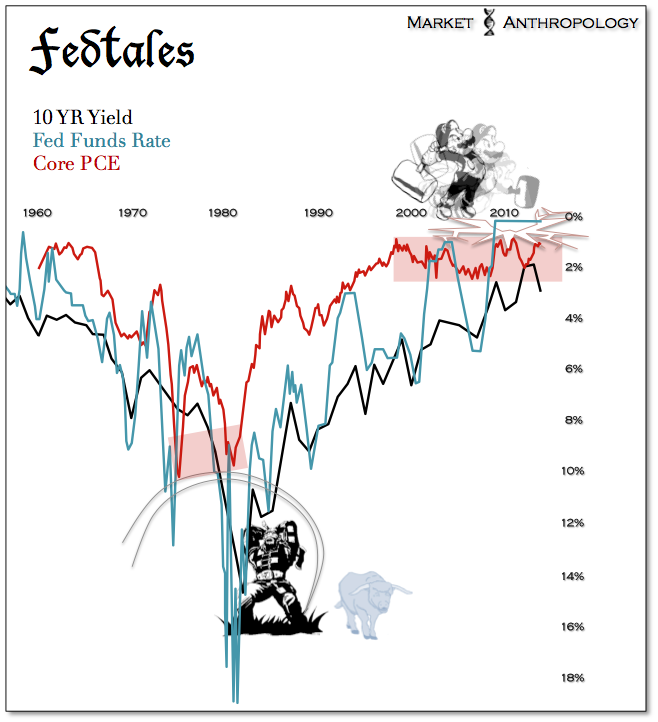 Although the fed funds rate and PCE data series only go back to 1954 and 1960, respectively - the historic chart of 10 year yields reveal the pivotal trend-line that resides (somewhat coincidentally) where the fed funds rate has remained since the end of 2008. While we don't expect runaway inflation anytime soon, we do believe another pulse will be moving through the system in 2014. 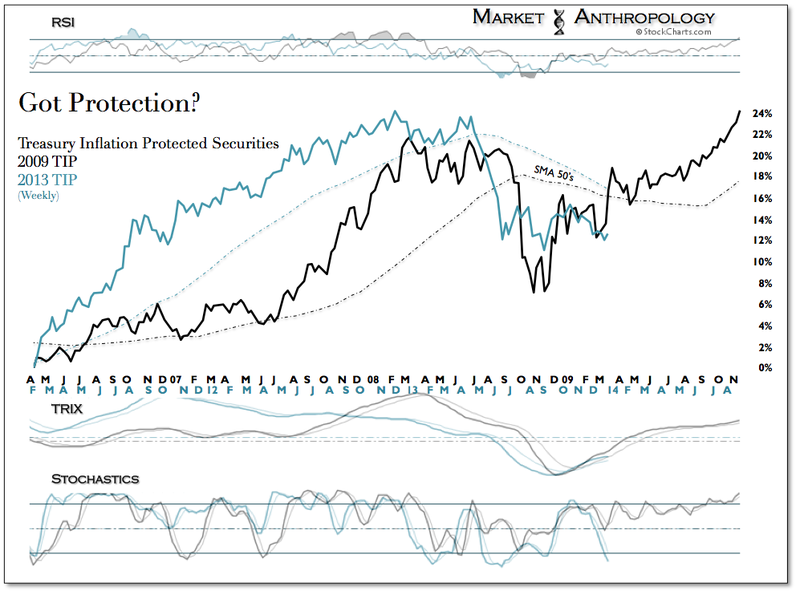 * The comparative series for TIP was normalized based on the respective momentum lows for the ETF.